Reliable information is required for the planning and management of eye care services. While classical research methods provide reliable estimates, they are prohibitively expensive and resource intensive. Rapid assessment (RA) methods are indispensable tools in situations where data are needed quickly and where time- or cost-related factors prohibit the use of classical epidemiological surveys. These methods have been developed and field tested, and can be applied across almost the entire gamut of health care. The 1990s witnessed the emergence of RA methods in eye care for cataract, onchocerciasis, and trachoma and, more recently, the main causes of avoidable blindness and visual impairment. The important features of RA methods include the use of local resources, simplified sampling methodology, and a simple examination protocol/data collection method that can be performed by locally available personnel. The analysis is quick and easy to interpret. The entire process is inexpensive, so the survey may be repeated once every 5-10 years to assess the changing trends in disease burden. RA survey methods are typically linked with an intervention. 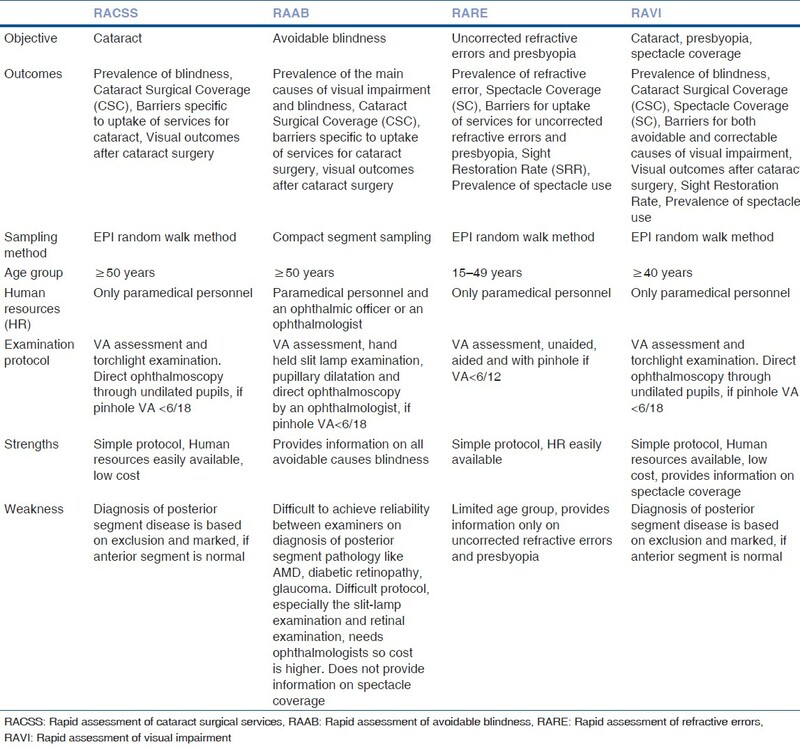 This article provides an overview of the RA methods commonly used in eye care, and emphasizes the selection of appropriate methods based on the local need and context. Health care in developing countries has limited resources and huge needs. These limited resources should reach those in greatest need. Rapid assessment (RA) methods are useful to prioritize the most affected regions, identify high risk groups and help develop targeted intervention for those who can benefit the most. RA methods are indispensable tools in situations where data are needed quickly and where time- or cost-related factors prohibit the use of classical epidemiological surveys. While they are not a substitute for conventional study methods, they have a wide range of applications in public health in needs analyses and monitoring interventions. , They work in tandem to plan and achieve the goal of efficient and effective health care services for all those in need. Even though RA methods are used with modifications in various public health contexts, certain factors are common to all of them. The problem under investigation should be of public health importance and information is a prerequisite for planning the services. The important features of RA methods include the use of local resources, simplified sampling methodology, and a short and simple examination protocol/data collection method that can be performed by locally available personnel. The analysis needs to be quick and easy to interpret. The entire process of RA is inexpensive, so that the survey can be repeated every 5-10 years to assess the changing trends in disease burden. RA surveys are typically linked with an intervention. The Extended Program of Immunization (EPI) Random Walk method and Compact Segment (CS) sampling method are commonly used sampling methods in rapid assessment studies. Despite the popularity of the EPI survey method, it has a few limitations. The first stage sampling is done based on population proportionate to the size method based on the recent census estimates, but in developing countries the census may not be accurate and up to date and hence may not reflect the true size of the population and the demographic profile at the time of survey. A census once in ten years does not reflect the possible changes and growth rate. Visual impairment in children is comparatively uncommon. The key informant approach that was devised to assess the burden of ocular morbidity in children has been successfully used in Bangladesh, Malawi, and other places for the assessment of childhood blindness. ,,, In this method, information on children who are blind is collected from prominent people in the community who are likely to know about these children. The eye examination protocol consists of visual acuity assessment using the modified Snellen 'tumbling E' chart with 6/60 and 6/18 optotypes on either side. A torchlight examination is performed to assess the status of the crystalline lens. The fundus is examined using a direct ophthalmoscope through an undilated pupil. Individuals with visual acuity <6/18 in either eye are referred to the nearest eye care facility for further investigation and treatment. Several survey teams work in parallel in different clusters so the fieldwork is completed in a few weeks depending on the sample size. The RACSS software is available from WHO to provide assistance at every stage of the survey-sample selection, data entry, and automated data analysis-without the need of a statistician, so as to make the whole survey process simple. Locally available staff are trained and used for the survey. In RACSS, the eye examination is limited to a torchlight examination and as the fundus examination is done through the undilated pupil with a direct ophthalmoscope, the prevalence of cataract is easily determined but not all posterior segment disorders. Performing a fundus examination through the undilated pupil is difficult in a field situation, this difficulty is compounded if a media opacity is present. The sampling procedure has drawbacks that are inherent in the EPI methodology, such as a bias in the selection of households by using random walk method. Despite the drawbacks, the data generated from the RACSS is useful for needs assessment and planning cataract services in a given area. When repeated at intervals of 5-10 years, RACSS can be an indispensable tool to evaluate cataract surgical services in a given area. RAAB uses compact segment sampling as opposed to the EPI random walk method used in RACSS. The first stage involves determining the sample size and then the selection of clusters based on the 'population proportionate to the size' sampling method. For the second stage sampling, a map of the study clusters with important landmarks/housing groups or blocks is obtained or if not available, prepared with the help of villagers and divided into equal segments so that each segment includes the number of individuals for each cluster, usually 50 people aged ≥50 years of age. One of the segments is randomly selected and the required number of subjects is examined using the RAAB protocol. The freely available RAAB software can assist at each stage of the survey. The examination protocol includes visual acuity assessment as in RACSS, but the examination of crystalline lens is performed by both torch and distant direct ophthalmoscopy. A slit lamp examination is done and if the subject's visual acuity is <6/18 in either eye, the is fundus examined through a dilated pupil using a direct ophthalmoscope. The initial part of the eye examination is performed by paramedical ophthalmic personnel and the latter part is performed by an ophthalmologist or an ophthalmic clinical officer. The RAAB method overcomes the limitations of EPI methods and is hence more robust than its precursor RACSS. However, its main drawback is that ophthalmologists or ophthalmic medical officers are required for the eye examination and to diagnose eye diseases. The availability of ophthalmologists is a crucial issue in many parts of the developing world. Moreover, the diagnosis of posterior segment disease using a direct ophthalmoscope may not be very accurate and the procedure is difficult to perform in a field situation. RAAB, like its predecessor RACSS, overestimates the prevalence of cataract and the examination protocol takes much longer compared with RACSS. Still, each cluster in RAAB is completed in one day, hence the validity of the term 'rapid'. The definition for uncorrected refractive errors is also not based on any sound and validated definition and does not address the problem of presbyopia. In RAAB, uncorrected refractive errors is defined as 'unable to see 6/60, but can see 6/18 when pinhole is used.' It should be noted that only two optotypes of 6/60 and 6/18 are used. Similar definitions are used in many studies. The other information that is specific to uncorrected refractive errors like spectacle coverage is also not provided by RAAB. Rapid Assessment of Refractive Errors (RARE) is used to assess the prevalence of uncorrected refractive errors, presbyopia, spectacle coverage, and barriers to uptake of services for refractive errors and presbyopia. , RARE is a methodology developed with a focus on uncorrected refractive errors and presbyopia. Typically, younger age groups, 15-49 years are selected for the survey, as refractive errors are a common cause of visual impairment in this age group. The Rapid Assessment of Visual Impairment (RAVI) is a hybrid RA method evolved from RACSS and RARE. It is used to estimate the prevalence and common causes of visual impairment, prevalence of presbyopia, spectacle coverage, cataract surgical coverage, visual outcomes after cataract surgery, and barriers to the uptake of eye care services. The sampling protocol is similar to that employed in RACSS and the EPI random walk method. The examination protocol consists of visual acuity assessment with and without pinhole and near vision assessment. A standard Snellen chart is used instead of the simplified Snellen chart with only 6/18 and 6/60 optotypes. In contrast to RACSS and RAAB, individuals aged ≥40 years are enrolled, which increases the sample size, as the prevalence of visual impairment in younger age groups is relatively low. The inherent drawback of overestimation of cataract in RAVI protocol remains, as posterior segment examination is not performed. Increase in sample size may impact the use of resources but may not be significant considering the nature of the survey. Trachoma is chronic conjunctivitis caused by an organism called Chlamydia trachomatis. Trachoma is classified into two phases: active inflammatory phase commonly seen in children and cicatrical phase seen in adults leading to entropion, trichiasis, corneal scarring and, ultimately, to blindness. Poor environmental sanitation, lack of facial cleanliness in children, and crowding are the main risk factors for trachoma. Onchocerciasis is an eye and skin disease caused by the organism Onchocerca volvulus. It is transmitted to humans through the bite of a black fly (Simulium species). The organism also invades the eye and causes irreversible blindness. The African Program for Onchocerciasis Control (APOC) used the Community-Directed Treatment with Ivermectin (CDTI) method for distribution of annual doses of Ivermectin. In CDTI communities take ownership for planning and implementing the Ivermectin distribution strategy. Before the mass distribution of Ivermectin, the target area is mapped using a technique called 'Rapid Epidemiological Mapping of Onchocerciasis' (REMO). From maps, areas with environmental risk factors like free-flowing rivers are identified. Following this, a Rapid Epidemiological Assessment (REA) is conducted, which estimates the prevalence of onchocercal nodules in adult males using simple palpation. Communities with nodule prevalence of 20% and above are eligible for CDTI. The interplay of these factors in the RA methods is presented in [Table 3]. Ethically, no survey should be done without service provision in place for all those who need it, and this should hold true for RA methods as well. Hence availability and range of eye care services impact the selection of method. However, RA methods can also be used to establish the need for services and in such situations, RA surveys provide the evidence base to prioritize the setting up services. RAAB would be an appropriate method where comprehensive eye care services are available or where there are plans for establishing comprehensive eye care services. In situations where only the services for cataract surgery and primary eye care services are available, doing a RACSS is preferable. Even a RAVI could be a good option and the services could be expanded to include uncorrected refractive errors and presbyopia. In cases where there is a high prevalence of posterior segment disease, it is appropriate to use a RAAB survey, although a cross sectional survey would be ideal if resources are available. As part of the survey, eye care services can be provided for all those who need them. Where services are not available, the results are used to plan and then provide services for those in need. For example, retinal laser for all individuals who have diabetic retinopathy and need such intervention should be helped with. Where vision cannot be restored, such as in ARMD, low vision devices and appropriate rehabilitation services should be provided. Because of its sheer magnitude, visual impairment is a challenge, which can only be tackled with a targeted approach involving three steps-(1) Planning based on evidence and an understanding of the perceived or felt needs of the community, (2) Appropriately trained human resources or in other words 'right people at right places,' and (3) Mechanisms to ensure long-term sustainability. Rapid assessments offer a comprehensive package of information that can help tackle the problem of visual impairment. It is nearly ten years since the launch of the VISION 2020 initiative, and probably time to look back and assess the achievements of this massive initiative. RA methods can play an important role in this process. Several new modes and models of community level intervention like vision centres have been introduced in different parts of the world, to reach people in need. It is now time to evaluate these models and replicate them in other places where such services are needed. RA methods can be useful tools in this endeavor. In Oman and Timor Leste, the surveys that were repeated at different time intervals in same geographical locations have shown trends in prevalence of visual impairment. , The RA can be repeated in other areas where were they conducted previously to gauge the impact of the VISION 2020 initiative. RA methods have stood the test of time and have evolved depending on the priorities in public health. When new and low cost technology like low cost portable non mydriatic cameras, and tele-ophthalmology to evaluate posterior segment becomes more easily available, RA methods may be modified to include more difficult and emerging conditions like diabetic retinopathy, glaucoma, and age-related macular degeneration. To conclude, RA survey methods can be one of those many stepping stones that lead to the success of VISION 2020: The global initiative to eliminate the avoidable blindness by year 2020. MacIntyre K. Rapid assessment and sample surveys: Trade-offs in precision and cost. Health Policy Plan 1999;14:363-73. Macintyre K, Bilsborrow RE, Olmedo C, Carrasco R. Rapid surveys for program evaluation: Design and implementation of an experiment in Ecuador. Rev Panam Salud Publica 1999;6:192-201. Guha-Sapir D. Rapid assessment of health needs in mass emergencies: Review of current concepts and methods. World Health Stat Q 1991;44:171-81. Dineen B, Foster A, Faal H. A proposed rapid methodology to assess the prevalence and causes of blindness and visual impairment. Ophthalmic Epidemiol 2006;13:31-4. Marmamula S, Madala SR, Rao GN. Rapid Assessment of Visual Impairment (RAVI) in marine fishing communities in South India--study protocol and main findings. BMC Ophthalmol 2011;11:26. Pascolini D, Mariotti SP. Global estimates of visual impairment: 2010. Br J Ophthalmol 2011;96:614-8.
WHO. Expanded Programme on Immunization (EPI). Wkly Epidemiol Rec 1993;68:323-7. Henderson RH, Davis H, Eddins DL, Foege WH. Assessment of vaccination coverage, vaccination scar rates, and smallpox scarring in five areas of West Africa. Bull World Health Organ 1973;48:183-94. Bennett S, Woods T, Liyanage WM, Smith DL. A simplified general method for cluster-sample surveys of health in developing countries. World Health Stat Q 1991;44:98-106. Henderson RH, Sundaresan T. Cluster sampling to assess immunization coverage: A review of experience with a simplified sampling method. Bull World Health Organ 1982;60:253-60. Lemeshow S, Robinson D. Surveys to measure programme coverage and impact: A review of the methodology used by the expanded programme on immunization. World Health Stat Q 1985;38:65-75. Turner AG, Magnani RJ, Shuaib M. A not quite as quick but much cleaner alternative to the Expanded Programme on Immunization (EPI) Cluster Survey design. Int J Epidemiol 1996;25:198-203. Chia EM, Mitchell P, Ojaimi E, Rochtchina E, Wang JJ. Assessment of vision-related quality of life in an older population subsample: The Blue Mountains Eye Study. Ophthalmic Epidemiol 2006;13:371-7. Nutheti R, Shamanna BR, Nirmalan PK, Keeffe JE, Krishnaiah S, Rao GN, et al. Impact of impaired vision and eye disease on quality of life in Andhra Pradesh. Invest Ophthalmol Vis Sci 2006;47:4742-8. Wong HB, Machin D, Tan SB, Wong TY, Saw SM. Visual Impairment and Its Impact on Health-related Quality of Life in Adolescents. Am J Ophthalmol 2009;147:505-511.e1. WHO. Global Initiative for the Elimination of Avoidable Blindness. WHO 97.61. Geneva, Switzerland: World Health Organization; 1997. Marmamula S, Keeffe JE, Rao GN. Uncorrected refractive errors, presbyopia and spectacle coverage: Results from a Rapid Assessment of Refractive Error survey. Ophthalmic Epidemiol 2009;16:269-74. Lu Q, He W, Murthy GV, He X, Congdon N, Zhang L, et al. Presbyopia and near-vision impairment in rural northern China. Invest Ophthalmol Vis Sci 2011;52:2300-5. Chakraborty S, Dutt D. Rapid assessment of childhood disabilities through key informant approach. Indian Pediatr 2004;41:1064-6. Kalua K, Patel D, Muhit M, Courtright P. Causes of blindness among children identified through village key informants in Malawi. Can J Ophthalmol 2008;43:425-7. Muhit MA, Shah SP, Gilbert CE, Hartley SD, Foster A. The key informant method: A novel means of ascertaining blind children in Bangladesh. Br J Ophthalmol 2007;91:995-9. Xiao B, Fan J, Deng Y, Ding Y, Muhit M, Kuper H. Using key informant method to assess the prevalence and causes of childhood blindness in Xiu'shui County, Jiangxi Province, Southeast China. Ophthalmic Epidemiol 2011;18:30-5. Venkataswamy G, Lepkowski JM, Ravilla T, Brilliant GE, Shanmugham CA, Vaidyanathan K, et al. 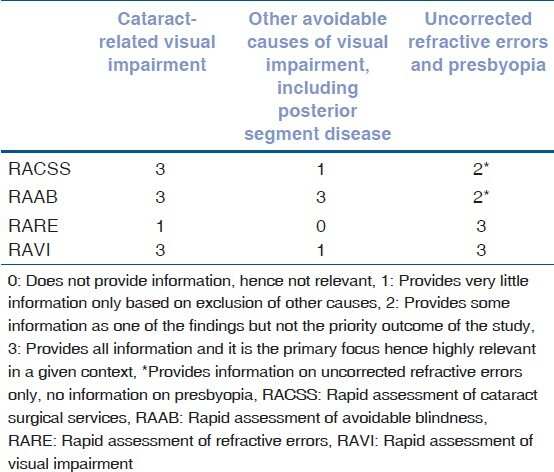 Rapid epidemiologic assessment of cataract blindness. The Aravind Rapid Epidemiologic Assessment Staff. Int J Epidemiol 1989;18:S60-7. Limburg H, Kumar R, Indrayan A, Sundaram KR. Rapid assessment of prevalence of cataract blindness at district level. Int J Epidemiol 1997;26:1049-54. Lansingh VC, Carter MJ, Martens M. Global cost-effectiveness of cataract surgery. Ophthalmology 2007;114:1670-8. Kuper H, Polack S, Limburg H. Rapid Assessment of Avoidable Blindness. Community Eye Health 2006;19:68-9. Polack S, Yorston D, Lopez-Ramos A, Lepe-Orta S, Baia RM, Alves L, et al. Rapid assessment of avoidable blindness and diabetic retinopathy in Chiapas, Mexico. Ophthalmology 2012;119:1033-40. Marmamula S, Keeffe JE, Raman U, Rao GN. Population-based cross-sectional study of barriers to utilisation of refraction services in South India: Rapid Assessment of Refractive Errors (RARE) Study. BMJ Open 2011;1:e000172. Lansingh VC, Carter MJ. Acceptance sampling rapid trachoma assessment (ASTRA). Surv Ophthalmol 2008;53:90. Negrel AD, Mariotti SP. Trachoma rapid assessment: Rationale and basic principles. Community Eye Health 1999;12:51-3. Ngondi J, Reacher M, Matthews F, Brayne C, Emerson P. Trachoma survey methods: A literature review. Bull World Health Organ 2009;87:143-51. Limburg H, Bah M, Johnson GJ. Trial of the Trachoma Rapid Assessment methodology in The Gambia. Ophthalmic Epidemiol 2001;8:73-85. Boatin BA, Richards FO Jr. Control of onchocerciasis. Adv Parasitol 2006;61:349-94. Ngoumou P, Walsh JF, Mace JM. A rapid mapping technique for the prevalence and distribution of onchocerciasis: A Cameroon case study. Ann Trop Med Parasitol 1994;88:463-74. Oyibo WA, Fagbenro-Beyioku AF. Adverse reactions following annual ivermectin treatment of onchocerciasis in Nigeria. Int J Infect Dis 2003;7:156-9. Wanji S, Tendongfor N, Esum M, Yundze SS, Taylor MJ, Enyong P. Combined Utilisation of Rapid Assessment Procedures for Loiasis (RAPLOA) and Onchocerciasis (REA) in Rain forest Villages of Cameroon. Filaria J 2005;4:2. Gorstein J, Shreshtra RK, Pandey S, Adhikari RK, Pradhan A. Current status of vitamin A deficiency and the National Vitamin A Control Program in Nepal: Results of the 1998 National Micronutrient Status Survey. Asia Pac J Clin Nutr 2003;12:96-103. Katz J. Sample-size implications for population-based cluster surveys of nutritional status. Am J Clin Nutr 1995;61:155-60. Khandekar R, Mohammed AJ, Raisi AA. Prevalence and causes of blindness & low vision; before and five years after 'VISION 2020' initiatives in Oman: A review. Ophthalmic Epidemiol 2007;14:9-15. Ramke J, Brian G, Naduvilath T, Lee L, Qoqonokana MQ. Prevalence and causes of blindness and low vision revisited after 5 years of eye care in Timor-Leste. Ophthalmic Epidemiol 2012;19:52-7. Marmamula, S., Keeffe, J., Narsaiah, S., Khanna, R., Rao, G.
Marmamula, S., Narsaiah, S., Shekhar, K., Khanna, R.C., Rao, G.N.